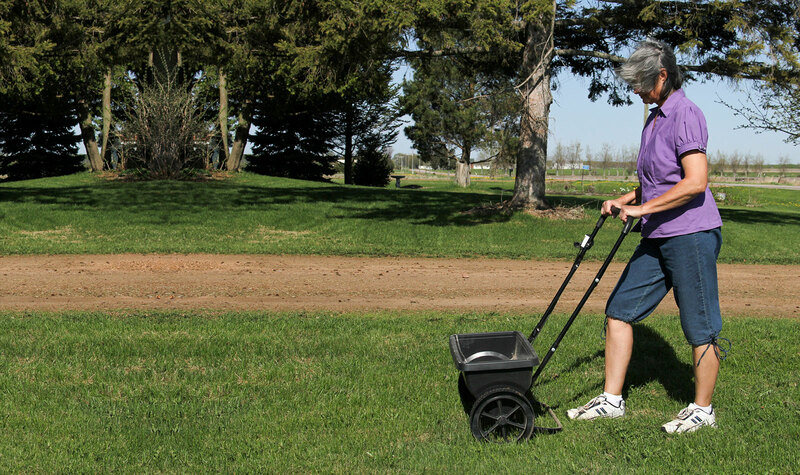 One of the questions our clients ask us, after inquiring when to fertilize their lawn, is how much to fertilize. We’re going to give you the answer, as well as a general overview of how to water your lawn. First, make sure you’ve chosen a quality lawn fertilizer. Since nitrogen is the most important nutrient, (expressed as the first number in the series of three on the fertilizer bag), look to the guaranteed analysis on the back of the bag. Determine if the nitrogen is controlled-release, slow-release, slowly-available, or water-insoluble nitrogen. Most quality lawn fertilizers provide a balance of fast and controlled release sources resulting in some quick color (without a big surge of growth) and some long-lasting nitrogen which will release over time. Make sure you choose a balanced fertilizer, such as a 10:10:10 mix. Use a 10:10:10 mix sparingly. Repeated use throughout the season may cause damage. No one wants to end up with “burn” marks on their lawn from too much nitrogen. The higher the percent nitrogen, the less product is needed on the lawn to supply the one pound per 1,000 square feet rate suggested. And, if the material is controlled-release, the risk of burning the lawn is low. As mentioned earlier, the suggested rate per application is about one pound of actual nitrogen per 1,000 square feet of lawn. If fertilizers were 100 percent nitrogen, which they are not, it would take a pound of fertilizer to apply this rate. Divide 100 by the percent nitrogen in the bag (first number expressed a whole number) to figure how much is needed per 1,000 square feet. For example, a fertilizer with 20 percent nitrogen would require 100/20 or 5 pounds of fertilizer product per every 1,000 square feet of lawn. First, determine the total area or square footage of the lawn. To determine this figure, take your total lot size and subtract everything not allotted to lawn. Next, subtract the square footage of the house, driveway, gardens, patio, walkways, garage, etc. Or, if the lawn is small enough, simply get out your tape measure and measure the lawn. Once you arrive at the square footage in lawn, divide this amount by 1,000. Multiply by the pounds of fertilizer needed per 1,000 square feet. This will give you the approximate pounds of fertilizer needed to spread on your lawn. Hope this helps. We’ll explore the nitrogen requirements for specific grass types and growing seasons in an upcoming article.